André van der Hoeven took this image of the Andromeda Galaxy in September 2014. A huge number of stars shine brightly in an amazing skywatcher photo of the Andromeda Galaxy. André van der Hoeven, a photographer based in the Netherlands, captured the image. It took van der Hoeven about 9.6 hours to complete the new photo of Andromeda, which was reprocessed since it was initially taken in September. "The galaxy came out quite a lot better in this new image," van der Hoeven told Space.com of the reprocessed image. Scientists think that the Andromeda galaxy (also called M31) will eventually merge with the Milky Way in about 4 billion years from now. Andromeda is located about 2.5 million light-years from the Milky Way and it is the largest galaxy in the galactic group where they are located. The merging of the two galaxies will likely create one large, elliptical galaxy unlike the Milky Way's current spiral shape. 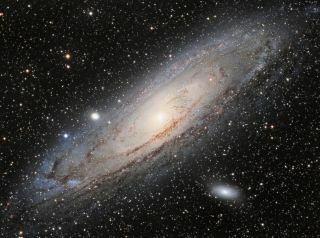 Now is the time to see Andromeda in the night sky, according to Starry Night Education's Geoff Gaherty. Draw a line straight out from the right-hand part of the "W" of the constellation Cassiopeia and you should find M31 glowing like a faint-fuzzy splotch in the sky, Gaherty wrote in a November skywatching guide. "Andromeda is so far away that its trillion stars combine to make a very faint glowing patch. You can see this most easily with binoculars," Gaherty said. "Once you spot it, however, if you have a dark sky, you should be able to see it with your unaided eye." Many amateur astronomers find it easier to spot Andromeda in binoculars rather than through a telescope. The telescope's field of view isn't wide enough to capture the entire galaxy, Gaherty added. You can see more of van der Hoeven's astrophotgraphy at his website here: www.astro-photo.nl. Editor's Note: If you have an amazing image of Andromeda or any other night sky object or any other skywatching photo you'd like to share for a possible story or image gallery, please contact managing editor Tariq Malik at spacephotos@space.com.